These are some of our favorite CBD gummies, hands down. From the flavor to the high-quality CBD used, they’re just about perfect. The only knock we give them is price, which is a little higher per mg of CBD than their competitors, although the free shipping helps keep the overall price down some. Regardless, we think these are well worth it however and can’t recommend Hemplucid CBD gummies enough. Buy and enjoy! Up next on our tour of gummy bears are the high dosage Hemplucid CBD gummies. These babies come with 25mg of CBD per gummy, so we’ve had our eye on them for a while. Let’s see if they stand up to our review process and uphold the good Hemplucid name. The idea behind this company is in its name – lucid. It means clear and easy to understand, and that is their aim. Hemplucid offers a small but variety line of products that are of high quality. They only use the full plant, so everything is full spectrum, and use nanoparticle CBD for some of their products. Yet another hit from Hemplucid with these CBD gummies. They produce really high-quality products, albeit at a higher price than most. These CBD gummies are infused with their full spectrum Whole Plant formula, as opposed to other brands that may just spray on the CBD. This method is much more effective and extends their life. Each gummy contains 25mg of CBD which is a nice amount. Like most other brands, these CBD gummies were packaged in a clear bottle with a label wrapped around it. It has a tamper-proof top, and everything about it looked very professionally done. This included all dietary information and nutritional facts, which once again gave it the air of a quality brand that offers transparency to its customers. Next came the tasting, and it was hard to decide which to start with as they came in a few different colors. We thought they might be different flavors also, but they seemed to taste the same to us. That isn’t a bad thing, as they had this fruity taste that was delicious! They were sprinkled pretty thoroughly with sugar, which we didn’t mind at all. The texture was good and they were fun to eat. After taking a bite, your taste buds will also pick up on just how much CBD oil each gummy has. For us, this was a great feeling as it reassured us that these guys meant business in terms of CBD. These are high dosage CBD gummies at 25mg each one, so don’t treat them like the candy that they look and taste like. If you are new to CBD, you may even want to start with half a gummy. Even for a more veteran CBD user, one should be plenty to get you through a day, to begin with, but feel free to add a second one in the afternoon if your body is lacking CBD. 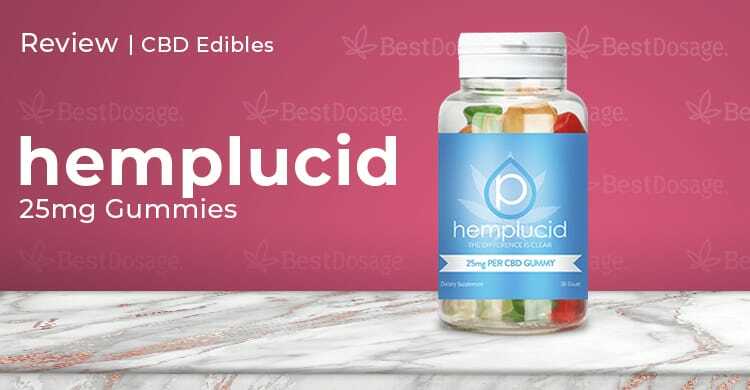 The Hemplucid CBD gummies are de-waxed for higher bioavailability, so it shouldn’t take as long to feel as others might. We always say that this will be a very individualized sort of experience, as all CBD is. Still, we can confidently say that Hemplucid CBD gummies absolutely did the job. All of us came away feeling that what we were dosing for was being targeted properly and made a difference. Definitely some of the best CBD gummies we have had in that regard. Organic evaporated cane juice, organic corn syrup, organic white grape juice concentrate, pectin sodium citrate, citric acid, ascorbic acid, Whole-Plant™ CBD, natural flavors, colors added (including annatto, turmeric, grape juice concentrate, red fruit juice concentrate). Hemplucid typically replies to emails within 24 hours, but sometimes their reply can get stuck in spam so check for that. You can also give them a call to their Utah offices, or simply live chat with them on their website. Everyone was really friendly and professional, so no complaints at all with their customer support. These are some of our favorite CBD gummies, hands down. From the flavor to the high-quality CBD used, they’re just about perfect. The only knock we give them is price, which is a little higher per mg of CBD than their competitors, although the free shipping helps keep the overall price down some. Regardless, we think these are well worth it however and can’t recommend Hemplucid CBD gummies enough. Buy and enjoy!